Well, Quilt Camp is over for this year, and what a fun experience it was! 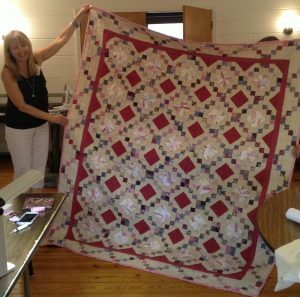 For me, it was a wonderful chance to slow down, relax a little, enjoy the town, the food, and most of all, the fellow quilters I was with. 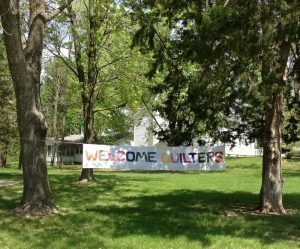 We had quilters from as far away as Florida, Georgia, North Carolina, Colorado, and New Jersey, and as close as just a few miles away. Quite a group! The week was stuffed full of wonderful, fun activities, yet it was all so relaxed and unhurried. We began with a finger-food buffet during a meet-and-greet session late Monday afternoon. 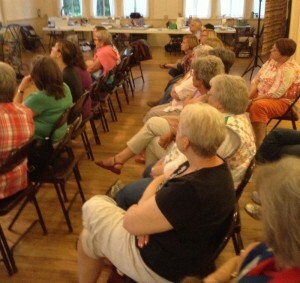 Several of the campers were return attendees, and some of us were new, and it gave us all a chance to acquaint and re-acquaint with everyone. I could tell right then it was gonna be a really fun week. Especially when the evening ended with a fabulous Show & Tell session! You all know how I love a good show & tell, and I was not disappointed. Show & tell is always so inspiring to me. Tuesday began the workshops. Jane Kennedy taught a class called Modern Improv, and all her students made really good progress. I loved seeing all the different color choices everyone had. We had good food, perfect weather, and an evening trunk show by me. Paula helped me hold up all the quilts, and my friend Hope took pictures for me. I showed them some of my Vintage inspiration projects, and some quilts that inspire me, and then mixed in a few of my newer things just for fun and variety. I hope they all enjoyed it. They were at least very attentive, see? Wednesday brought more workshops, more good food, more wonderful weather, and a tour of a pre-Civil War mansion (more on that later). The evening consisted of Klonda and Jane showing us some of their inspiring work. Klonda and Jane were also teachers at camp, along with Judy Smith and myself, and a special guest who came in and taught a needle-felting class on Thursday. Klonda showed us a couple of her Kaffe Fassett creations. 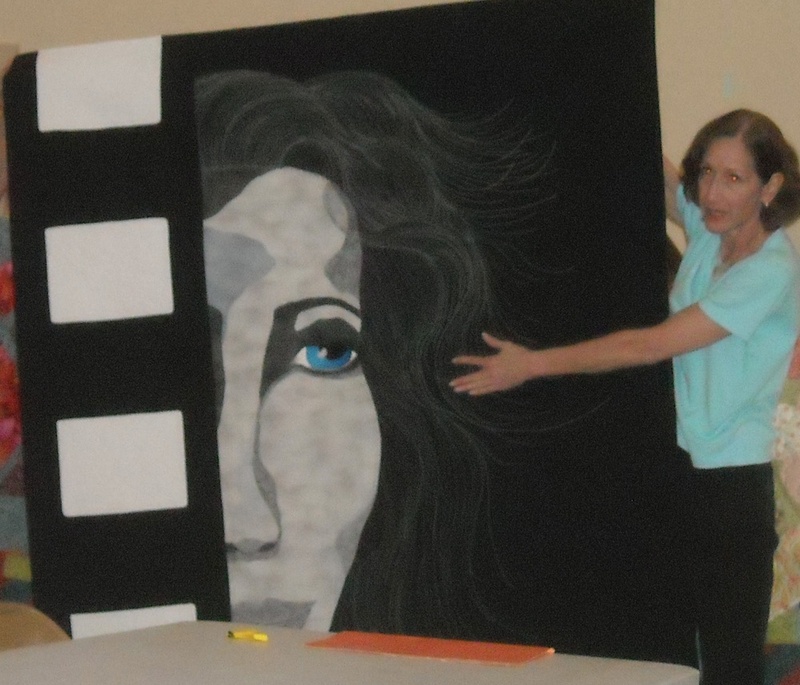 She makes wildly colorful quilts that look difficult, but she swears they’re not. 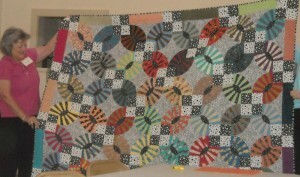 You can see more of Jane’s quilts on her web site HERE. Thursday was the final day of workshops, still more good food (can you believe it? ), still wonderful weather (just a brief shower), and in the evening, we were treated to a skit written and performed by camper Belinda and her crew — so funny and entertaining. We also played games — hysterically fun! Friday morning, we all gathered one last time for a class project show & tell, and to say our goodbyes and voice our hopes of returning again next year. I’m already looking forward to it. Our hosts, Paula and Larry, worked themselves silly to keep us well-fed, comfortable, and entertained. They’re probably still recovering from us today! But we all sure appreciate their efforts — they did a fantastic job. The accommodations were wonderful. I got to stay in a Bed & Breakfast just a block from the schoolhouse where the classes were held. Kathy, the hostess, didn’t even mind that I turned her upstairs into a sewing studio for the week, and pieced on a quilt top in my room when the day’s activities were finished. My “roommates”, Diane and Vera, were also very understanding of my late night sewing, and swore they never heard a thing! The B&B also had a resident cat, Mr. Fancy Pants, so I felt right at home with an assistant on hand! I hope I get to stay in the same place next year. The breakfasts were beyond explanation — I could never even tell when it was lunch time because I didn’t get hungry! 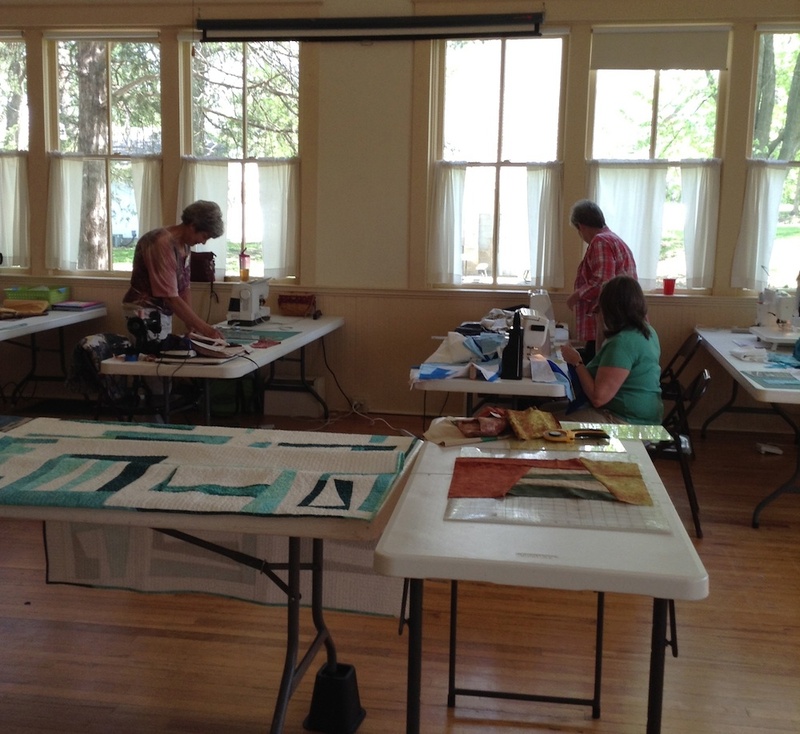 I taught 3 days of needle-turn hand applique, and I hope my students learned a lot. 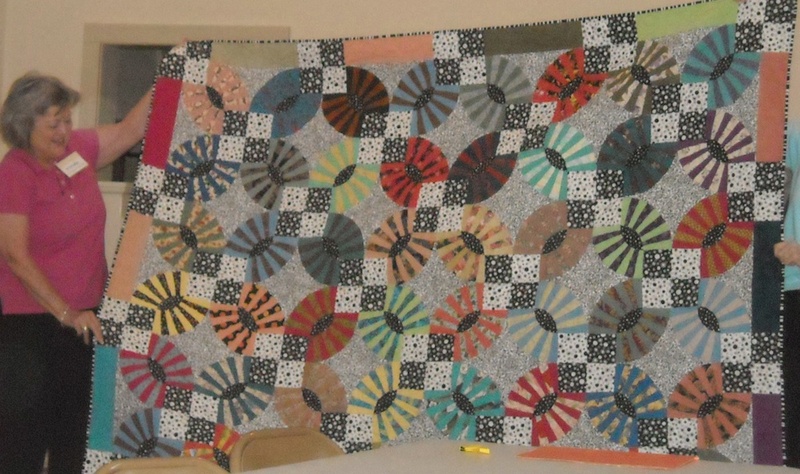 Linda left camp with her entire table runner very close to finished! My good friend, Hope, was a camp attendee this year, and it gave us a chance to visit and catch up as well. While she was at camp, she finished her oldest UFO. 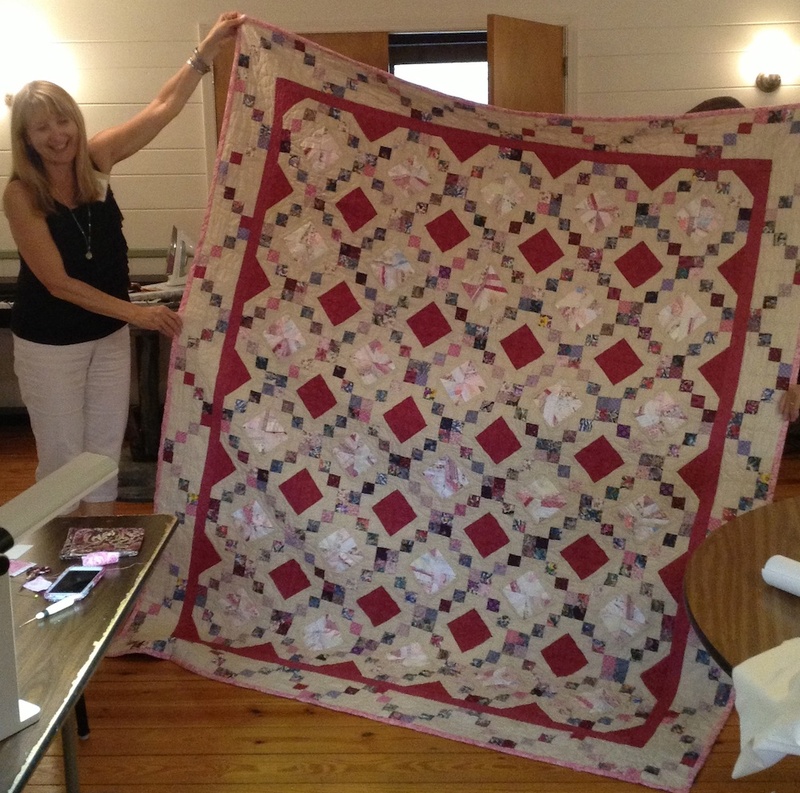 She started this quilt 32 years ago, and put the binding on during camp! If you’re looking for a wonderful quilting experience to take part in, I highly recommend Arrow Rock Quilt Camp. You will not be disappointed. The dates are already set for next year, and classes will be announced before long. You can visit the web site HERE to catch all the latest information. I knew you would love Arrow Rock. Judy is such a nice person too. Makes me wish I was a quilter! I can confirm that it was a great week and I sure enjoyed working with you. 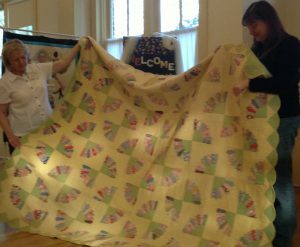 Those are beautiful quilts! It look like a great time! Quilting must keep everyone young. I haven’t seen Hope for more than a decade and she doesn’t seem to have aged a bit. Nice quilt too. Nice summary of camp. Already looking forward to next year! Glad you had such a wonderful time at Camp! I think I need to join you and bring my UFOs. I will be the one up with you at night still piecing.